The Kissed Mouth: It's Poetry Day Again! Due to my magnificent planning skills I found out it's National Poetry Day this morning. I can't decide between the two poems I have written so here they both are. They share the common theme of the uncertain position models find themselves in at the hands of an artist. This is, of course, Woman with a Fan from 1870, by Dante Gabriel Rossetti. 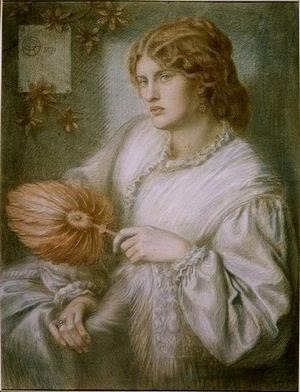 At the time this was drawn, Rossetti had stopped using Fanny as his regular model, and his affections had been very much transferred to Jane Morris. His health had suffered, and in 1869 Elizabeth Siddal's coffin had been dug up for the poems that the half-blind, half-mad Rossetti felt he needed in order to survive. Fanny had been cast out and pulled back by her lover repeatedly over the previous ten years and would suffer more of the same until Rossetti's death. One thing that remained was her love. Can’t see beyond a love that’s new. My heart is still the same. And Oh Sweet Lord I love this man. And yet remain the same. And sink in with my feeble claws. Yet love you all the same. The second poem is about Alexa Wilding in 1865. 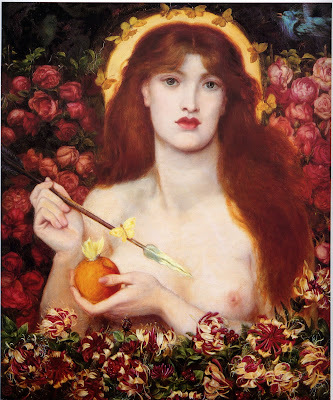 Can you imagine how precarious her situation was when Rossetti asked her to be his model? She had steady if difficult work as a seamstress and a frankly unstable man offers her the promise of more money. I wonder how she felt at the end of the first painting - would he keep her? How did the painter deal with the woman when she wasn't being his muse? I felt you turn before you spoke and I am now deceived. The brush is down, you are relieved, the heat has thus receded. I am an empty coffer. The model wore the lover’s mask, the ribbon’s pulled to fraying. I know you won’t be staying. Happy National Poetry Day, m'darlings! These are lovely! Who knew you had a poet's soul?